This second photo has always been one of my favorites. 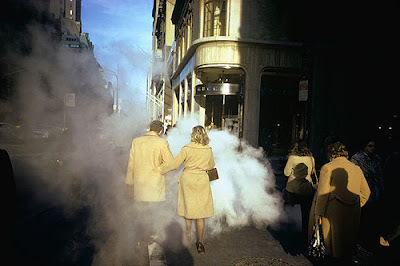 It is very surreal with the two shadows cut out of material the same color as the couple on the left, and oh yeah how bout if we envelope the whole scene in smoke for effect? I'd always wondered about the circumstances of its exposure. How had Meyerowitz seen that? Had it been luck or a sharp eye or...? What was going on at the moment he'd shot it? Seeing this first photo I have a much better understanding of how he got the second. The circumstances are very similar. Winter sunlight, smoke from the grate highlighting shadows, shot from virtually the same vantage. 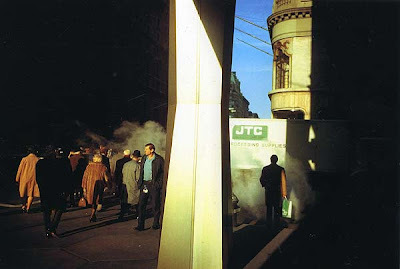 The situation is obvious: Meyerowitz was casing this corner for a particular type of photo. He probably shot hundreds out of which these two are the only ones to make the cut. All of the sudden my appreciation for the second photo shifts a bit. Instead of being some divine exposure it's merely the result of hard work, maybe standing on that corner all day or whatever it took. Yeah, I know it's still the same photo as before but now I've seen what went into the sausage. Some of the mystery is gone from that photo. Perhaps it would've been better if I hadn't seen its shadow. what joel's shadow is splitting hairs [to act with care and great subtlety], but after spending an entire day or a month or a year, that shadow, to me, is divine.